Better late than never. President Trump is about to give a severe hair cut to Dodd-Frank regulations. Banks and business owners both are going to breathe a huge sigh of relief over this one. Regulations have gotten so bad that no one even bothers looking for a business loan anymore. As for getting a home loan, that has gotten ridiculous as well. I will be glad to see Dodd-Frank go down. And no, I don’t think it was done with the best of intentions. I think it was meant to strangle small businesses and give big banks a lot more power. The stock market has been on a tear ever since Trump was elected. Optimism is at an all-time high. But if you look at polls, Trump’s approval numbers just keep going down. Part of that may be healthcare, but more to the point… the polls lie. Illegal immigration has dropped a whopping 67% this year. Our military is growing again and our police can now do their jobs. A conservative is about to become the next Supreme Court Justice and things have eased up considerably across the board for Americans in general. All this despite endless attacks from the left and the media… I would say Trump is more than holding his own here. 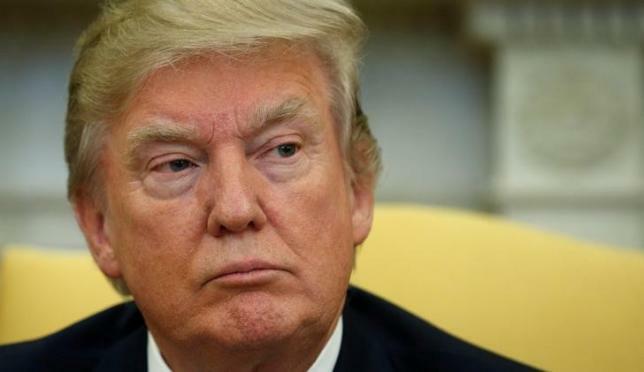 U.S. President Donald Trump said on Tuesday that his administration is working on changes to Dodd-Frank banking regulations that will make it easier for banks to loan money. “We’re going to be coming out with some very strong – far beyond recommendations – we’re going to be doing things that are going to be very good for the banking industry so that the banks can loan money to people who need it,” Trump told a meeting with a business leaders from the New York area at the White House. “We’re going to do a very major haircut on Dodd-Frank. We want strong restrictions, we want strong regulation. But not regulation that makes it impossible for the banks to loan to people that are going to create jobs,” Trump said. If President Trump can reduce taxes significantly, our economy will truly get a boost that we desperately need. Getting rid of regulations is also freeing up businesses once again. Trump signed an executive order that mandated two regulations be abolished for every new regulation added. From there, he signed multiple bills eliminating burdensome Obama-era regulations. That is exactly what what was needed. I just wish there was more of it and it was faster. Dodd-Frank has been in place since 2010. It should never have been passed and it was a catastrophe after it was implemented. Democrats are going to scream bloody murder over Trump eliminating this beast. But it has done the opposite of what they promised… it has strangled smaller banks and made the big ones even bigger and more totalitarian. Competition is always a good thing. Level the banking playing field and let small banks enter the market once again and compete for customers. It has a side effect of also keeping the big boys honest… or at the very least, more honest.